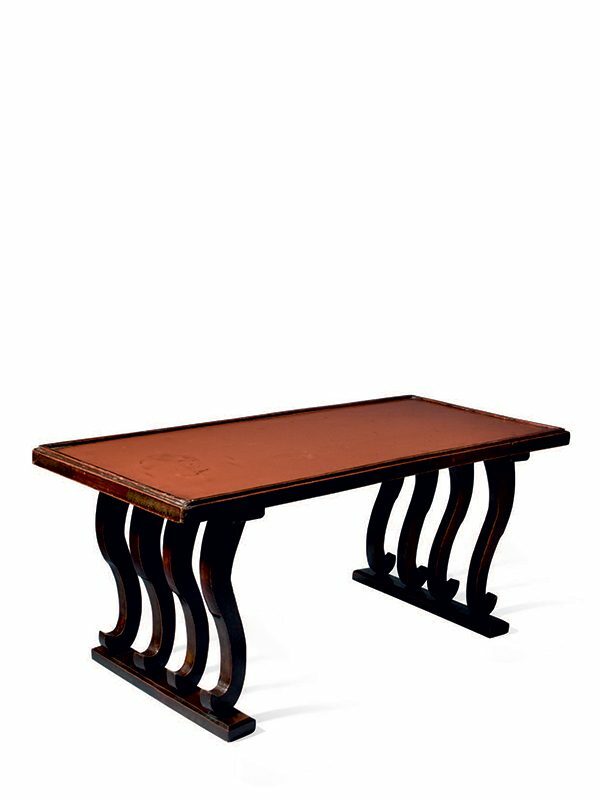 A lacquered wood low table of rectangular shape, supported on eight legs. Each short side has four legs, bowed and joined together with flat stretchers. The top has a slightly recessed, raised edge and is covered with a layer of vermillion lacquer. The sides, legs and stretchers are covered in deep brown lacquer. The top of this low table is covered with a layer of vermillion lacquer that can be qualified as Negoro lacquer. The name Negoro comes from the Buddhist temple Negoro­ji in Kishu, where lacquer ware was apparently made in this style prior to the temple’s destruction by fire in the 16th century. The original use for this beautiful Negoro lacquer low table was possibly as a serving tray, particularly indicated by its raised edge. A comparable low table, described as a tray, was exhibited at the Okura Museum of Art in 2009. While it appears that the precise form of this table is unrecorded, it is intriguing to note that a Chinese lacquer rectangular incense table from the Tang dynasty (618 – 906) survives that is of similar form and is also supported on eight tall, bowed legs.